The C-123 troop and cargo transport was designed by the original Chase Aircraft Company. A production order for 300 C-123B, held by the Kaiser-Frazer Corporation (which had acquired a majority interest in the Chase company in 1953), was cancelled in June 1953. 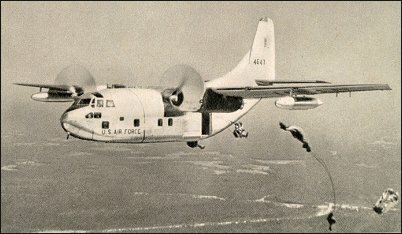 New bids were asked for, as a result of which production of the C-123B was assigned to Fairchild. The first Fairchild-built C-123B flew on 1 September 1954 and production aircraft entered service with the USAF's 309th Troop Carrier Group in July 1955. Orders totalling more than 300 aircraft were completed by mid-1958, six going to Saudi Arabia and 18 to Venezuela. In 1955 the prototype C-123B was fitted experimentally with two Fairchild J44 turbojet engines mounted at the wingtips to provide auxiliary power for use in an emergency. As a result ten production aircraft were modified into C-123J with turbojet engines fitted. Meanwhile a small number of C-123H had been produced with wide-track landing gears. The prototype YC-123H was later experimentally fitted with CJ610 auxiliary turbojet engines and flown on 30 July 1962. Having been tested in South Vietnam as a counter-insurgency aircraft, 183 more C-123B were given 12.68kN General Electric J85-GE-17 auxiliary turbojet engines in underwing pods and designated C-123K. Some were further converted to AC-123K Spectre gunships for service during the Vietnam conflict. I was an EWO and Air Intel On the Black birds (no insignia, no tail number) at 1st Flight Det, Nha Trang 1968 and 1971-72. I'll tell you, that airplane was fabulous - it would take ground fire and keep-on keepin' on. We did take the gear doors off early in the program so the vegetation and banana trees didn't rip them off in some of our more 'interesting' landings. Gary (redacted) and I found out that, if you land without putting the gear down, it took all the power from our two recips and two jets just to taxi. 1st Flight Det was one of my highlights of my 27 year career. I'd just like to get near one, again. I flew the C-123b & K models from TSN AB, Vietnam in 1968 and had a crew chief noseart a K-models with my wufes and daughter's name on it. I have had a model made in The Phillipines and it looks great, with the proper tail number (54-684) and all other appropriate markings of the 19th SOS. I am looking for a pilot's flight manual to go along with a flight manual I have from another source. Is there anyone who can put me in contact with a pilot's flight manual for the C-123K? Thanks for any efforts you may incur. Also performed in flight calibration of stall warning system...Even managed to get in some right seat stick time...Love to do it again!!! I'm looking for a checklist (C-123) for Flight Simulator X. Your ride was in a Thai marked C-123K that belonged to the 19th Air Commando Squadron stationed at Tan Son Nhut AB, Saigon. 1/3 of your squadron was Royal Thai AF. We had 2 planes with Thai Markings, which you flew in. Our crews mixed member when that was the assignment. Hope this helps clear up your question. My Grandfather flew with the First Flight Det 66-67. Maj Elmer "Doc" Miller, he was the Primary Mission Pilot and Logistics Officer and I'm looking for anyone who might have served with him.